Records must be verified by an independent source. All record attempts and record attempt vehicles must be submitted to the WRRA records committee before the record attempt via the Record Request form. Members of the Recumbent Records Committee are all current recumbent racers. Record requests will be processed and records will be verified in a timely manner. Past records will be verified and added to the records page as time permits. New records for approved record attempts will be approved/disapproved by members of the Recumbent Records Committee based on pre-approval and verification of time, course and wind conditions. The date, time and location and altitude of the attempt. The names of the vehicle designer(s), builder(s), and rider(s) and the name(s) of the person(s) or organization(s) applying for the record. Speed and direction of wind as required by event. Evidence of timer calibration and accuracy. Evidence of course measurement and accuracy. A statement that all of these regulations and conditions have been complied with, signed by the applicant and both observers. An unfaired recumbent bicycle has two wheels in any configuration or length. The vehicle construction shall be such that its shape does not overtly direct airflow around the rider's body, nor attempt to reattach the airflow behind the rider by use of tail fairing devices. The only exception being the use of an aerodynamic shaped helmet. The vehicle can incorporate aerodynamic fairings to make its structure and components more aerodynamic. Allowed fairings are: rotating wheel covers and splitter plates. Please do not use foot fairings. Your vehicle will be scrutinized and may be moved to "Tail or Nose Faired Recumbent" class if you push the boundaries too far. Same as Unfaired Recumbent Bicycle, except vehicles in this class must have 3 or more weight bearing wheels, and two of those wheels must have a minimum track width of 250mm. Tail faired recumbent construction shall be such that its shape does not overtly direct airflow around the rider's body, but it may attempt to reattach the airflow behind the rider by use of tail fairing devices. A tail fairing may not extend forward past the riders torso. An aerodynamic shaped helmet is allowed. The vehicle can incorporate aerodynamic fairings to make its structure and components more aerodynamic. In addition to the tail or nose fairing, allowed fairings are: rotating wheel covers, and splitter plates. Altitude: Altitudes below 700M (2296 ft) without notation. Record attempts above 700M must state the actual altitude. Except for courses for the road race events, and the time trial events one hour and over, all courses must meet the following flatness requirement: If an imaginary line is drawn from the end of the timed portion of the event course back toward the beginning of the course but sloped upward at a slope of 2/3 percent (1 meter in 150), at no point may the vehicle course pass above this line. Curved courses may be used for any event, Use of velodrome banking not higher than 6 meters above the lowest part of the finish line is allowed. All curved courses must be clearly marked with the limiting inside boundary. Any vehicle crossing a wheel over this boundary shall be disqualified from the run. Course distance shall be measured from the inside boundary of turns. Separate Records will be kept for Straight line and Velodrome courses for 200M flying start and 1 kilometer standing start categories. Straight line records must exceed any existing velodrome records to be granted. In order to qualify as a record course, distances and elevation difference must be measured and certified by a registered Civil Engineer, a registered Land Surveyor, or a person with equivalent training. For record attempts under 15 minutes all timing must be accomplished by automatic start and stop actuation. Timers must be certified as accurate to within 1/100 of a second in 10 minutes or 1 second per day at a temperature of 20 degrees/C, plus or minus 5 degrees/C. Certification must be by a chronographic testing service or a registered Electrical Engineer. Timing to the nearest 1/100 second is required, and timing to the nearest 1/1000 second is preferred. Events in excess of 15 minutes may be manually timed with two or more stop watches. Unlimited from Head wind to 85 deg. frontal cross wind. Tailwind to a 85 deg. frontal crosswind, the wind velocity must not exceed 6 (six) kilometers per hour (1.67 meters per second). Wind velocity measurement must be taken during the duration of the actual timed run at the finish of the course, at a level of 2 meters above the course surface. These restrictions apply to closed and straight courses. There are no wind restrictions for time trial events of one hour or longer, or for distance events of 100 km or greater, provided the event is held on a closed course and at least one full lap is completed. The geometry of vehicles competing under this rule shall be fixed: there will be no sails or moving control surfaces specifically intended to enhance the sailing characteristics of the vehicle. Drafting: Absolutely no drafting is allowed. No rider may be assisted in any record attempt by a pacing vehicle used for the purpose of aerodynamic assistance. Energy Storage: No device which stores energy over more than one input power cycle (e.g., one leg stroke), or which releases energy under control of the operator may be used in any event except the road race, or speed events longer than one mile. Energy storage devices are permitted in these events provided no energy is stored before the start of the event and that this energy is created within the timing section of the attempt and that its source is human power. Absolutely no chemical, electrical, kinetic, potential, or other form of energy storage are allowed at the start of the event. In events with a flying start the accumulation of the kinetic energy of vehicle and rider(s) is permitted. The vehicle may accelerate over an unlimited distance prior to entering the timed portion of the course. 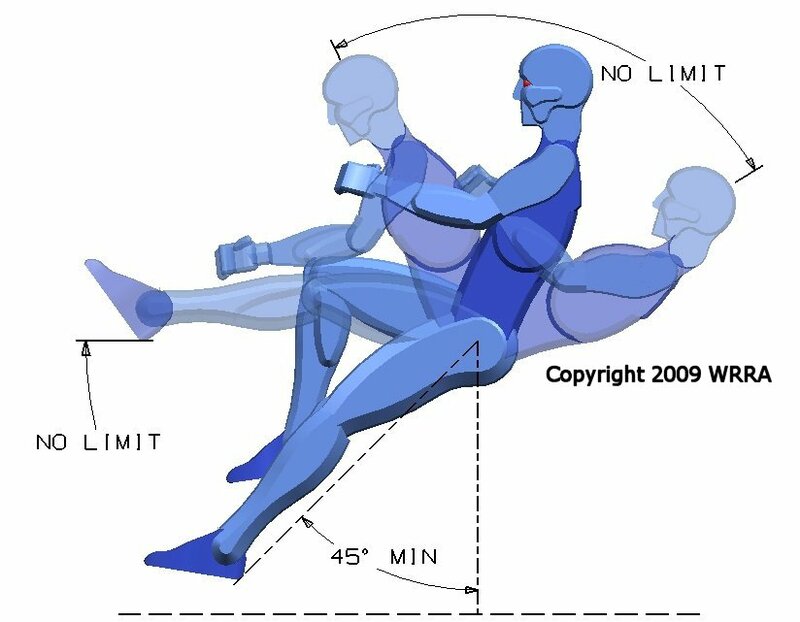 All vehicle momentum gained prior to the timing section must be made by human powered efforts of the rider(s) as required in other sections of these rules. Competitors in the standing start kilometer event shall line up not more than 10 cm from the point of tripping the timing device. Competitors in standing start events longer than the kilometer shall line up not more than 1 m from the point of tripping the timing device. These distances were selected to preclude a competitor from getting a "running start" and also to avoid tripping the timing device prematurely. For record attempts, Fixed gearing is the minimum level of braking system allowed. Brakes are not required for single rider velodrome record attempts, but they may be a requirement of the race organizer or an event rule. Casco Warp 2 and Warp III carbon while not stickered meets the EN 1078 specification. The heels of the rider must be at a minimum 45 degrees forward from a vertical line running through the rider's hip. The rider must face forward. The upper body may be at any angle. The rider may not use mirrors or video vision for primary navigation but they are acceptable for rear or side view. Riders submitting applications for records must pledge that they were not under the influence of performance enhancing medications such as steroids, or Amphetamines, EPO or similar products. Any legally prescribed medications and their reason for use must be disclosed. Riders must submit to blood testing when requested.